Our lives are not our own, or so say the alleged authorities who claim we owe our energy to them. To whom exactly, do we owe the fruits of our energy? Do they have the right to demand anything from “we?” Did we engage in a contract with anyone? Did we agree to be owned? Did we harm anyone? So who or what do we owe? Who is the injured party? Who has a lawful claim to our labour, our intellectual property, or our own bodies, or babies? No one, right? Are we sure? Can we even answer these questions in our minds? If we all, all of us in the whole world, owe a DEBT of contract, injury, or honour of some type, to someone or something, to whom could the whole world owe such a DEBT? Who or what could be so great, that we all owe them our lives and energy? Our creator? Well, if that’s the answer, who could argue? Humbly we stand inferior. That’s the way it is. That’s the way it’s going to be. Our creator, the great spirit, doesn’t reach down from heaven for us with a gun. That’s more of a reach up from hell kind of a deal. We can narrow things to a few logical choices, provided we can actually see what we’re actually looking at, in plain sight! The saying, “it’s right there!” can seem a bit frustrating, especially when nothing at all seems to make sense. Then there’s the problem with deception or seduction or even worse, both, or of course, those and more. First, we could look toward what we know. What we think we know, but don’t, well, that’s a combination of a whole category of perils! We know we don’t owe anyone, but someone thinks we do, and we know it isn’t our creator, and they do really sneaky things to trick us into concealed pseudo-contracts to own us. Did we know that when we signed the BERTH CERTIFICATE that we were giving up something? More concealments? What should we expect from Satanic Zionist Jesuits? So who or what is doing this to us? This is where critical thinking is our only hope. The awful, ugly, undeniable, inevitable, inescapable truth is there, under our noses! Who has centuries and millenniums to plan, connive, creep and slither throughout time to ruin and destroy the world and all of the creator’s work, and people? The Dark Lord, of the Dark Star, Saturn/Satan, inventor of EVIL and DEATH, Lucifer, and his cohorts, fellow fallen angels. They’re the ones enslaving everyone. They’re the harbingers of DEATH, doom, and demise of man. Here in modern times, they’re still the same seeds of Cain, the Moneychangers, the Lawyers, the BA’AL worshippers, the Jesuits, the Talmudic Zionists pretending to be Jews, pretending to be white men, and pretending to be the “Chosen People,” the Israelites. They are neither, none of the above. They’re demonic by nature. They rob, kill, and laugh. They created CORPORATIONS, BANK-RUPT-SEA, DEAD PERSONS, and DEBT. The people are their HUE-MAN Sacrifice to their Lord, Lucifer. The Crown – Vatican – Swiss Bankster Cabal, and their lowest of low, the lowest form of Nobility, The Crown Temple B.A.R. Esquires/Attorners/Brokers/Executors De Son Tort. Your birth certificate is the bond with your name written in all CAPITAL LETTERS on it, and therefore it is the financial document that has the value of the bounty on your head. This is why your birth certificate is traded on the stock market. If you don’t mind, this isn’t a thread about the merits of metals, but about recent history, and worse things we can expect if we don’t wake up and demand some accountability from our alleged servants in government. The fact of the matter is, the United States did go “Bankrupt” in 1933 and was declared so by President Roosevelt by Executive Orders 6073, 6102, 6111 and by Executive Order 6260 on March 9, 1933, under the “Trading With The Enemy Act” of October 6, 1917, AS AMENDED by the Emergency Banking Relief Act, 48 Stat 1, Public Law No. 1, which is presently codified at 12 USCA 95a and confirmed at 95b. You can confirm this for yourself by reading it on FindLaw. Thereafter, Congress confirmed the bankruptcy on June 5, 1933, and thereupon impaired the obligations and considerations of contracts through the “Joint Resolution To Suspend The Gold Standard And Abrogate The Gold clause, June 5, 1933” (See: HJR-192, 73rd Congress, 1st Session). When the Courts were called upon to rule on various of the provisions designed to implement and compliment FDR’s Emergency BANKING Relief Act of March 9, 1933, they were all found unconstitutional, so what FDR did was simply stack the “Court’s” with HIS chosen obsequious members of the bench/bar and then sent many of the cases back through and REVERSED the rulings. House Joint Resolution 192 (HJR-192), 48 Stat. 112, was passed by Congress on June 5, 1933. The ‘Act’ impaired the obligations and considerations of contacts and declared that the notes of the Federal Reserve banks were “legal tender” for the payment of both public and private debts, and that payment in gold Coin was against “public policy”. (In effect, FDR and Congress, under executive orders and legislative fiat, nationalized the people’s money, i.e., their gold Coin. Nationalization is a violation of the Law of Nations and existing public policy of Congress. See: Hilton vs. Guyot, 159 U.S. 113 (1895). The gold Coin that was confiscated (nationalized) was later used to purchase voting stockholder shares in The Bank and The Fund at $35 per ounce.) At this point in time, “Fair Market Value”, i.e., a willing seller and buyer, without compulsion, lost any substantial meaning. Moreover, all of the Governor’s of the several States of the Union, who were summoned to and were in Washington, D.C. during the several days of this pre-planned economic “Emergency” (the first phase of which was to nationalize and expropriate the people’s Money, i.e., their gold Coin on deposit in the banks), pledged the full faith and credit thereof to the aid of the National Government, and formed various socialist committees, such as the “Council of State Governments”, “Social Security Administration”, etc., to purportedly deal with the economic “Emergency.” The Council of State Governments has been absorbed into such things as the National Conference Of Commissioners On Uniform State Laws, whose headquarters is located in Chicago, Illinois, and “all” being “members of the Bar”, and operating under a different “Constitution and By-Laws”, far distant from the depositories of the public records, and it is this organization that has promulgated, lobbied for, passed, adjudicated and ordered the implementation and execution of their purported “Uniform” and “Model” Acts and pretended statutory provisions, in order to “help implement international treaties of the United States or where world uniformity would be desirable.” (1990/91 Reference Book, NCCUSL). These organizations operate under the “Declaration of INTERdependence” of January 22, 1937, and published some of their activities in “The Book Of The States.” The 1937 Edition openly declares that the people engaged in such activities as the Farming/Husbandry Industry had been reduced to mere feudal “Tenants” on the Land they supposedly owned. Wisdom comes in many ways. Today, it came in many ways, with the help of our ability to see that we must first unlearn the horrific lies taught to us, and then our ability to recognize that we and the world have a common enemy that wants us dead. The Satanic Zionist-Jesuit Banksters, the high Masons, the Attorneys, and most visible of all, again, the U.S. Corporation, which is run by the MOSSAD and the Crown Temple B.A.R.. The Wraiths in the Black Robes are the enemy of the people, with no exaggeration. Awaken, and spread the word to everyone you know. Make a difference!!! 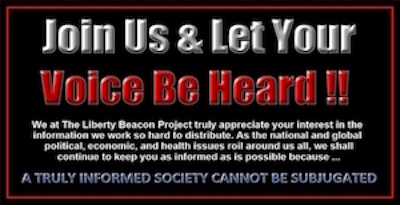 JOIN The Liberty Beacon Project! Be a member! Add your voice and help us to change the world!